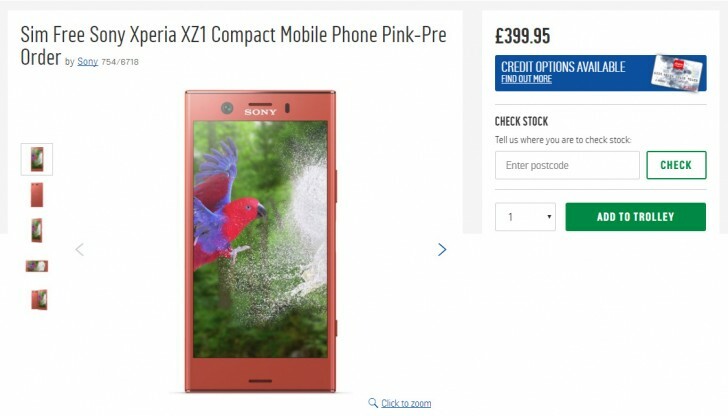 Okay, this is probably a mistake but the Sony Xperia XZ1 Compact is available for pre-order at £400 at Argos UK – not £500 as Carphone Warehouse is charging. True, you don’t get a pair of fancy headphones, but this is a killer price for the super mini. The large XZ1 is £600 as usual. Again, this may be a wrong price from Argos. You can also see that the black model is listed as “XZ1” (not Compact) even though it says 4.6” screen in the specs below (Source 2 link). That is to say that it’s not clear if Argos will honor this price if you hit “pre-order”. We poked around some other British sites and they maintain the original pricing - £600 for the bigger XZ1 one, £500 for the small one. As of this morning, 14th Sep, price has been adjusted back up to £499.95 for the compact. Shame! It's not actually letting me order, it says 'We were unable to place your order at this moment, please try again later' when I type in a post code for 'my nearest store', whichever postcode I put. Such a bummer.